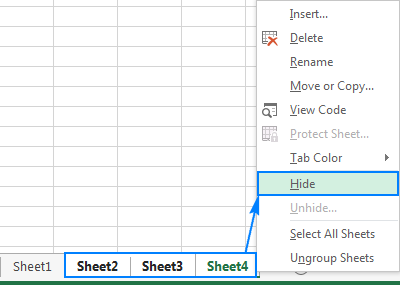 Learn how to quickly hide selected worksheets in Excel via the right-click menu and how to hide all sheets except active one with VBA. 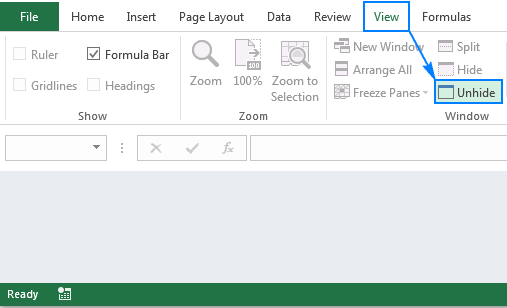 Normally, when you open Excel, you can see all sheet tabs at the bottom of your workbook. But what if you don't want all of your worksheets to be there? Say, some sheets contain source data referenced by your formulas and you'd rather not show that data to other users. Fortunately, you can easily hide as many sheets as you like as long as at least one spreadsheet remains visible. Select one or more sheets you want to hide. 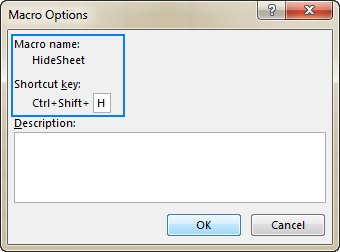 This tip explains how to select multiple sheets. Right-click the selection and choose Hide from the context menu. Done! The selected sheets are no longer in view. To select a single sheet, click its tab. To select multiple contiguous sheets, click the tab of the first sheet, hold down the Shift key, and click the tab of the last sheet. 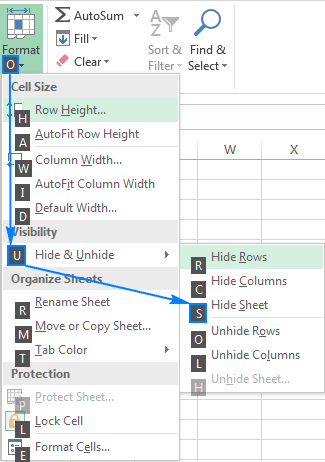 To select multiple non-contiguous sheets, hold down the Ctrl key while clicking the sheet tabs individually. To select all sheets, right-click any sheet tab, and then click Select All Sheets. It is not possible to hide absolutely all sheets in a workbook, at least one sheet should remain in view. Therefore, after you have selected all sheets, hold the Ctrl key and click one of the sheet tabs (any tab except the active one) to unselect that sheet. Selecting multiple worksheets groups them together; the word [Group] appears after the file name in the title bar. To ungroup the worksheets, click any unselected sheet. If there is no unselected sheet, right-click any of the selected sheet tabs, and choose Ungroup Sheets from the context menu. Select the sheet(s) you want to hide. Under Visibility, point to Hide & Unhide, and click Hide Sheet. Although Microsoft Excel provides no keyboard shortcut for hiding sheets, one of the following workarounds can work a treat. U selects Hide and Unhide. If you want to be able to hide sheets with a single keystroke, use the following simple macro to hide selected sheets, and then assign a key combination of your choosing to execute the macro. MsgBox Error, vbOKOnly, "Unable to Hide Worksheet"
Go to the Developer tab > Code group, and click Macros. Under Macro name, select the HideSheet macro, and click the Options button. In the Macro Options window, type a letter in the small box next to Ctrl+. If you type a lowercase letter, it will be CTRL + your key. If you capitalize the letter, then it will be CTRL + SHIFT + your key. Select the worksheet you don't want to hide (that will be your active sheet). Paste the above code in the Module window. That's it! All the worksheets except for the active (current) sheet are hidden at once. 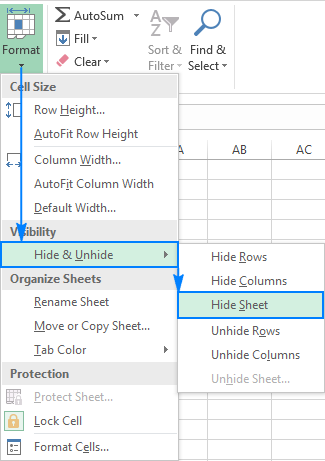 Aside from hiding specific worksheets, Excel also enables you to hide the entire workbook window. For this, you go to the View tab > Window group, and click the Hide button. As soon as you do that, the workbook window and all sheet tabs will disappear. To get your workbook back, go to the View tab again, and click Unhide. As you see, it's very easy to hide worksheets in Excel. And it's almost as easy to unhide sheets. If you want to make it more difficult for other people to view or edit some important data or formulas, then make your worksheet very hidden. Our next tutorial will teach you how. Please stay tuned! One Response to "How to hide sheets in Excel"
how do i hide a worksheet based on a cell value (yes\no)? Similar process to hiding a row based on a cell value.